The Mount Rushmore National Memorial in South Dakota features the faces of Presidents George Washington, Thomas Jefferson, Theodore Roosevelt, and Abraham Lincoln carved into the side of a mountain. Presidents’ Day is a national holiday that honors President George Washington and President Abraham Lincoln. In some communities, parades are held to celebrate the holiday. People also honor the day by learning more about the Presidents. Some even visit historical sites that were important to Washington or Lincoln. Presidents’ Day began as a celebration of Washington only. From the 1880s until 1971, it was observed on Washington’s birthday on February 22. Lincoln’s birthday was never a national holiday. However, many states celebrated it on February 12. In 1971, the holiday honoring Washington was moved to the third Monday of February. This was so that workers and students would have a three-day weekend. Since then, Washington’s birthday and Lincoln’s birthday have been celebrated on the same day. 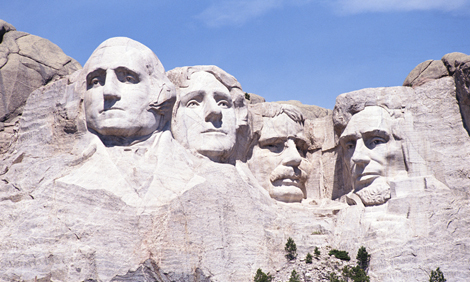 Many people today see Presidents’ Day as a day to honor all U.S. Presidents, past and present. Another way people celebrate Presidents’ Day is by eating cherry pie, which was Washington’s favorite dessert. This tradition also relates to the cherry tree story about Washington. According to legend, when Washington was a young boy, he chopped down his father’s cherry tree. When his father asked him what had happened to the tree, young Washington said, “I can’t tell a lie, Pa; you know I can’t tell a lie. I did cut it with my hatchet.” Because of Washington’s honesty, his father did not punish him. This story has never been proven to be true. Still, teachers and parents like to tell the story to teach the importance of being honest. Learn more about Washington, Lincoln, and the rest of the U.S. Presidents at the official website for the White House. Find out more about the U.S. Presidents from George Washington to Barack Obama from articles, videos, facts, and photos. Discover more about the Presidents through facts, images, and stories. Which two Presidents are honored on Presidents' Day? Which President's birthday did some states celebrate on February 12? Which of the following is a Presidents' Day tradition?